The Santa Cruz Hightower is a big bike for big rides. It has 135mm of rear travel and a 67 degree head angle ready to tackle challenging terrain and long days in the saddle. It is a bike that can handle an Enduro race, a bike park or a quick fast spin on the local terrain. It is long, low and slack but also an efficient pedaler with a 74.3 seat angle. It is an agile and playful bike with 17.1 inch stays and a 150mm dropper post. The two configurations are shown here with the 27.5 Plus on the left and 29er on the right (click to enlarge). A Plus bike or a 29er first? But wait, it has a trick up its sleeve. It is a 27.5 Plus bike as well with three bike configurations that can be purchased with 2.8 inch 27.5 wheels out of the box. The key to all this is it’s not retrofitted with Plus tires or 29er tires compromised at either setup. It truly is optimized for both configurations. This is accomplished by a Flip Chip rear shock mount that raises the bottom bracket when the bike use 27.5+ wheels. The fork is also converted from 140mm to 150mm to maintain the bottom bracket height of 13.27 inches in either configuration. Head angle is 67 degrees in 29er mode and 66.8 in 27.5 Plus mode. 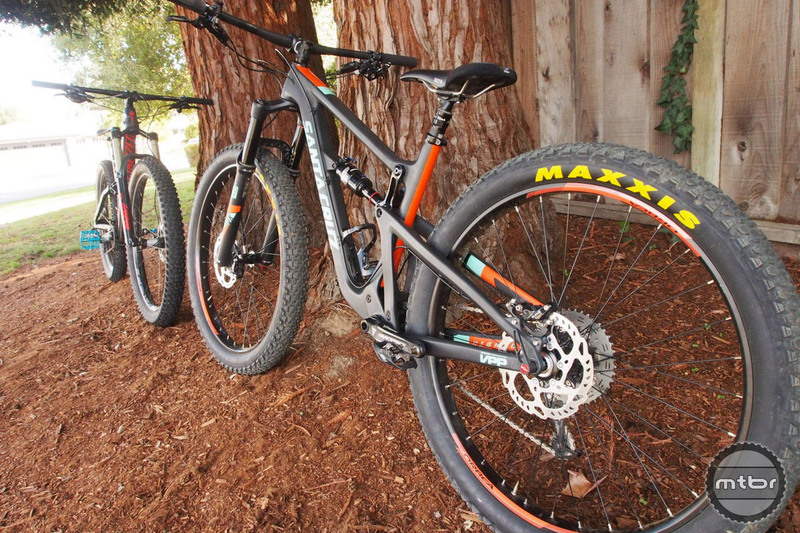 Since the wheels are Boost front and rear, it’s able to fit 29er tires and 27.5 Plus tires with ease. What we arrive at here is a bike with a massive sweet spot. It is a long and slack 29er that is capable and playful in one form. It’s ready to take big, fast, epic rides were speed and precision are coveted. Then the owner can have an extra set of wheels and convert the bike over to a 27.5 Plus wheels to maximize traction on loose conditions. Shock absorption on extremely rocky and rooty terrain can be tackled too with very low tire pressures on 2.8 tires mounted on 40mm internal Easton Arc wheels. 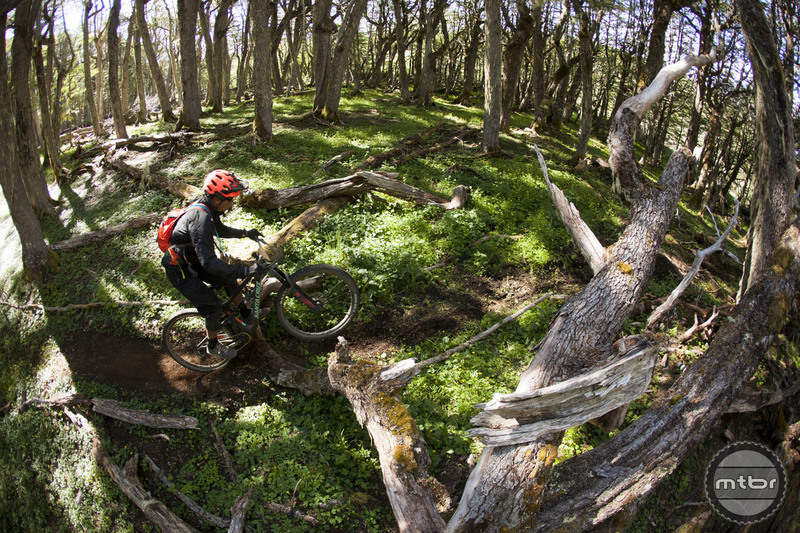 Mtbr’s FC jumping a log in the Patagonia forest (click to enlarge). This bike joins the Santa Cruz Bicycles hit parade that has been propelled by the recent wave of the Nomad, Bronson and 5010. This bike follows the same gene pool which is the characterized by long, low, slack bikes with incredible VPP suspension performance. Gone are the days of stiff suspension under pedaling as it’s replaced by bikes with supple suspension and excellent traction. Santa Cruz Hightower looks very chunky when we test fitted it with 3.0 tires (click to enlarge). If you’ve ridden the latest Nomad and Bronson, then you’ll have a good idea about how this bike feels. It is supple with it’s smooth and responsive suspension and it is a carving machine with its short stays, low bb and stiff wheels. The 150mm dropper post is perched on a steep seat angle for excellent climbing performance and the seat gets out of the way for aggressive descending. Reach is long and stack is low as it’s optimized for wide 800mm bars and a 50mm stem. This type of Dual Wheel-Tire Versatility from the Inception of the Design will Hopefully become the Norm for many Mid to Hi End Bikes from Now-on. The impact of this Plus Sized 2.8 x 27.5 set-up, has yet to be fully realized, like the wholesale migration to 27.5 & 29ers, it only takes a single ride on a Plus sized bike to get hooked! Good Times ahead for anyone willing to give them a Go! Newer riders will never know how good they have it, having never even ridden a small wheeled-tired ride to compare them too! If B+ were truly compelling it’s hard to imagine why anyone would want to convert the bike to 29. Otherwise, it would seem better to keep the 29 and run a 29+ front for times when more tire is needed. I think this faux versatility is a passing fad; what the industry really wants, sadly, is a transition to an exclusively 650B lineup. 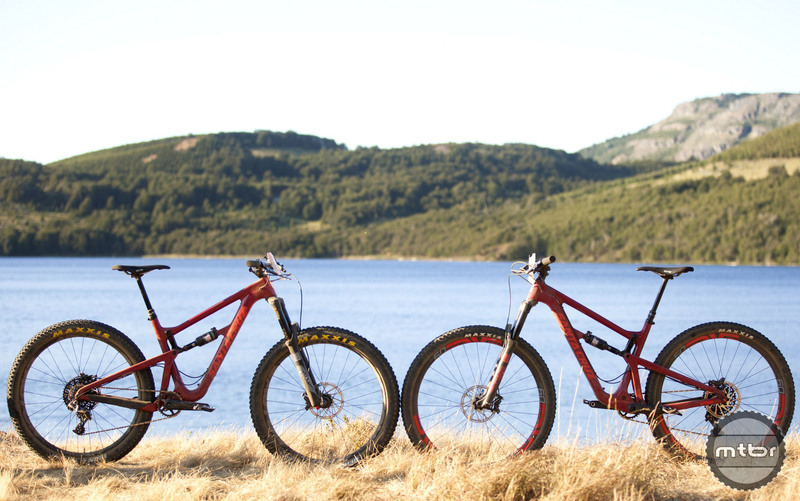 Promoting viable 29er applications as dual B/29 is a step in that direction. 27.5 Plus is compelling only to a select few right now as folks are still trying to digest it. Probably 20% will buy it as Plus. But in two years, I predict 50% will go Plus for the Hightower. Plus has very real advantages but 29ers are here to stay. It’ll be an interesting couple of years. Giving the user a choice with one investment is good as long as the bike is not compromised. The problem with Plus is that the tires are not up to it. They are flimsy, which means you have too many flats in rough terrain. They offer amazing levels of grip except when riding fast in challenging terrain, when they tend to have funny steering and a sudden loss of grip. They also fail in mud. For Plus to really work, we’d need beefier tires. Until then, many riders looking for more grip will prefer a 2.5 all mtn tire. Look at 650B: It is now in its fourth year, and the really good tires have only appeared recently. It also draws developers’ time and budget and the LBS now have to maintain stock on three wheel sizes (with 26″ it was argued this was not feasible economically). 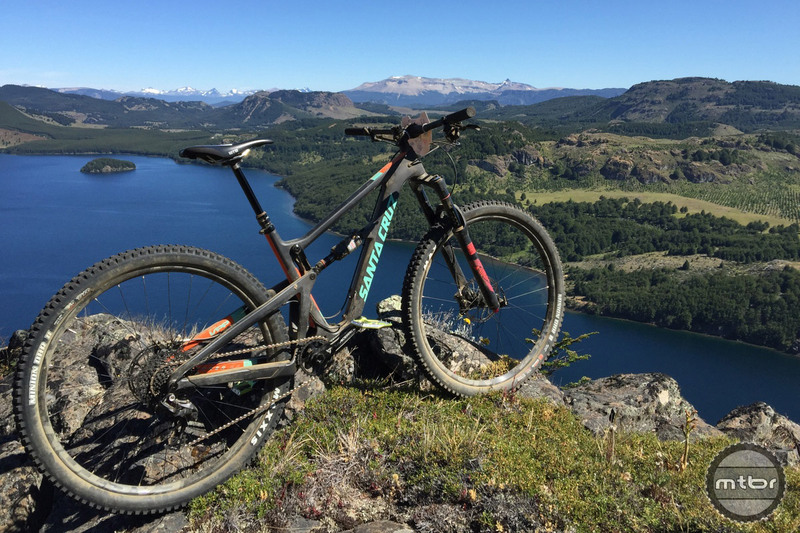 It took us so many years to get 29er geometry dialed, and now that we have it (and the tires), they screw it up again by creating compromise bikes. I’ve tried a Plus bike. I’ll try it again in 2-3 years when they have the right tires and dialed the geometry. How does it peddle uphill compared to Pivot or Yeti’s technology? Like this bike quite a bit. Was really looking forward to the Tallboy LT successor. But am I the only one looking for water bottle location on this frame and finding nothing? I’ve never been a fan of the camel bags. Small water bottle fits just fine (like magic). Large water bottle actually fits but there’s some contact. Single ring only = no interest. Can’t do long rides on a single ring above 7,000′. Maybe I just need to get stronger. How does it ride compared to the stumpjumper fattie? Way not 29+, 27+ is so last season. And again boost hubs? ?to fit +sized tire Just by fox instead of pike. Interested if it’s really can fit +size tire like 3” on 52mm wide rim. Is this rim width a mistake: “…very low tire pressures on 2.8 tires mounted on 40mm internal Easton Arc wheels”? On the Easton site, the biggest Arc 37.5 rim has a 30mm internal width. Too bad. I was excited that Easton had moved into “big volume” territory.